In July, AED Heidi Taylor headed to the Sunshine Coast for a collaboration with Kendra Fanconi and The Only Animal team on a site-specific workshop of Tinkers. The show is an adaptation of the 2009 Pulitzer Prize winning novel Tinkers by Paul Harding. This new transcendentalist’s work features an intimate and dazzling relationship with the natural world, woven into a story of family karma. After developing the script in this year’s Colony, Kendra turns her attention to integrating the design of the piece. The creative team, including children from the community, a choir led by Viviane Houle, a cast of professional actors, and seven designers, were on site at Crystal Creek. 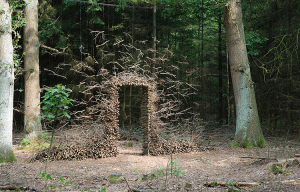 German installation artist Cornelia Konrad experimented on site with her signature approach to natural materials. Heidi has been working on the process design with Kendra, and was very hands on up on site. 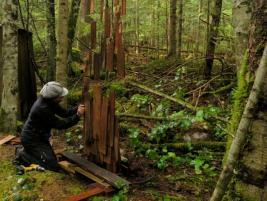 “Kendra treats all the participants on site as artists. We are invited to bring ideas and responses to the site forward. It’s a hugely generative process. Part of my role is to track how the story, characters, and themes are expressed in all of the design experiments. What needs to be said in words? What is expressed through the action of the actors? What will the choir add? All of these questions are very alive for us,” notes Heidi, following a planning trip to Joe Creek, The Only Animal’s creative headquarters outside Roberts Creek. The public had an opportunity to be part of the process in a site-specific showing at Crystal Creek on Saturday, July 25th, 2015.